Reluctantly, we packed up this morning and headed out for a long day on the road. Good thing we started early (7:30), because we spent 9 hours on the road today. Texas is HUGE! The most pleasant part of our day was early in, traveling through Hill Country. The mostly flat terrain has a bit of a gentle roll to it, and the enormous ranches along the way all have interesting, elaborate gateways at the road. Yea! I did see one Texas Longhorn, but didn’t get a photo. We also passed a farm of chubby miniature horses, and many sheep and goat farms in addition to the cattle ranches. Then, ranches turned to cotton farms. F-L-A-T lands! The most interesting part of this was seeing the harvested cotton waiting to be hauled out of the fields. It’s packed into giant bales, each the size of a semi tractor trailer. Then, a protective colorful plastic is spread over the top, and they are randomly left in the field. Cotton harvest time must have been fairly recent, as the bales were plentiful. The last two hours were stupifyingly dull. It’s so flat – no trees or anything at all to provide a break from the few oil wells, pumping steadily. The amount of roadway litter is incredible. Texas needs to promote an Adopt a Road program – abundant plastic bags and fast food litter really leaves a bad impression. 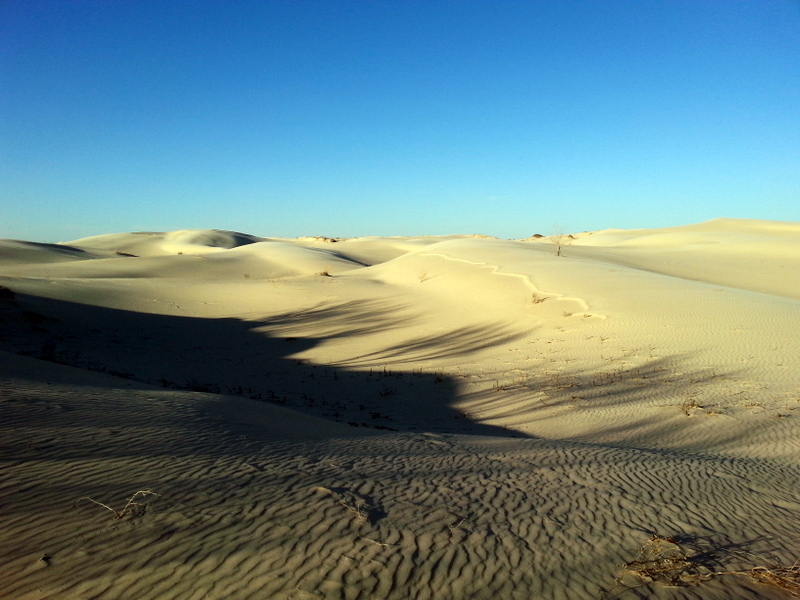 But, what a surprise when we suddenly came upon our campsite for the night at Monahans Sandhills SP. 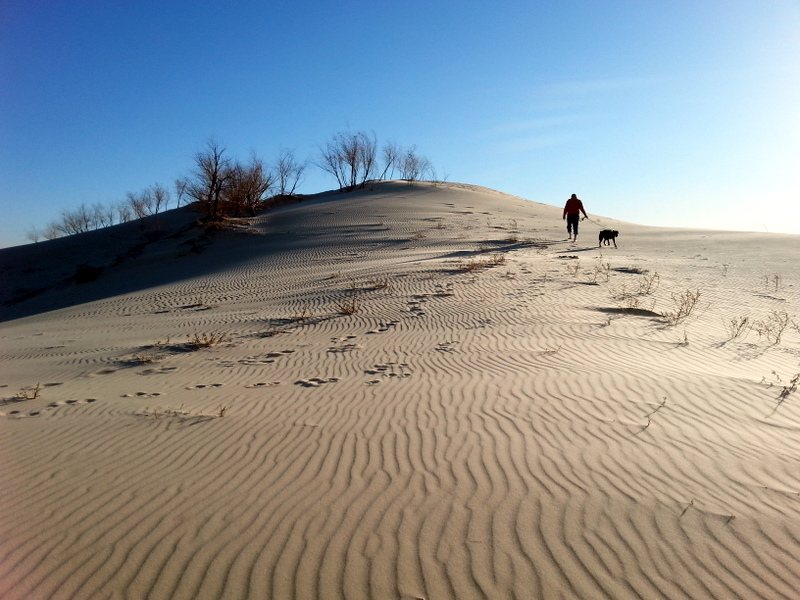 We’ve got sand dunes in Michigan – great ones. But, we’re used to seeing sand that rolls down to a giant lakeshore. These just roll down into other sand dunes. Think Saudi Arabia. After a long day in the Firetruck, we enjoyed stretching our legs and watching Jezzy leap around. Had a true camping dinner of some locally-smoked sausage, which we grilled, along with a can of beans and some grilled sweet peppers. Willie Nelson on the radio. Ah, camping at its finest. 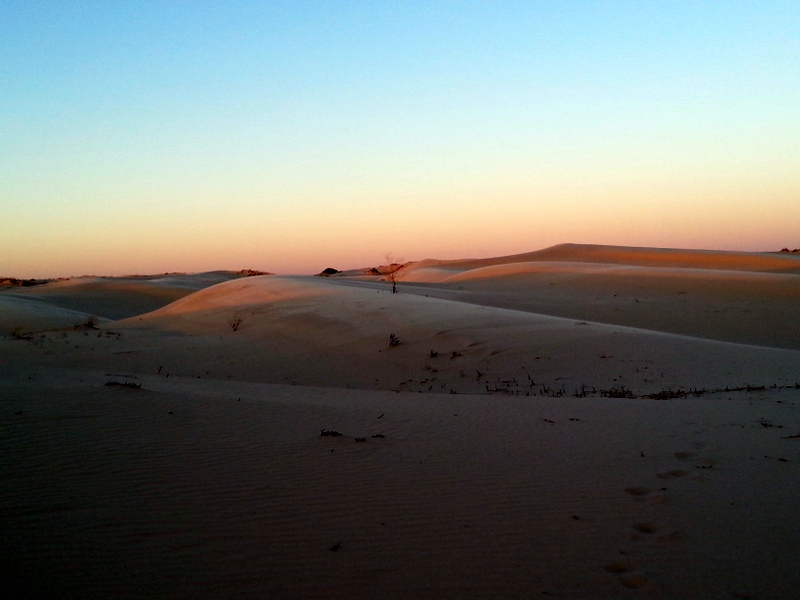 The spectacular sunset sent me back out on the dunes to try a few more shots. 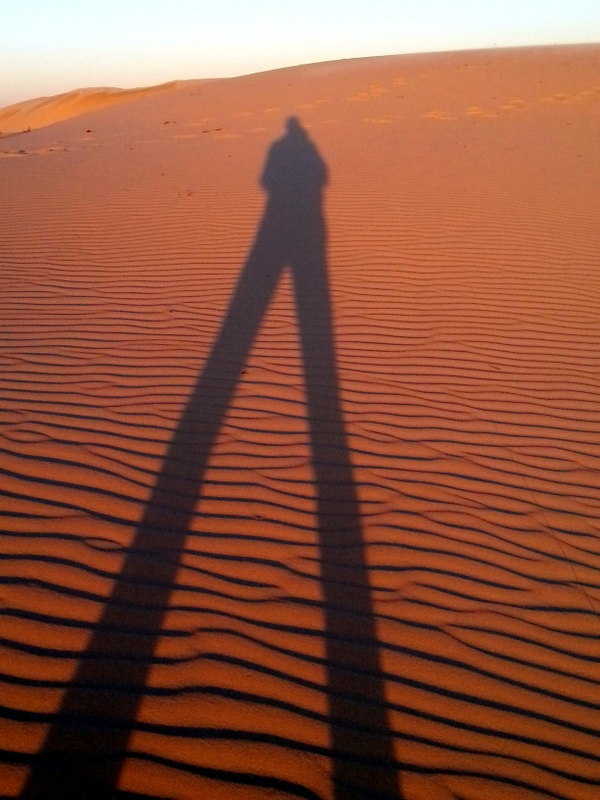 I’ve always wished I was taller…. 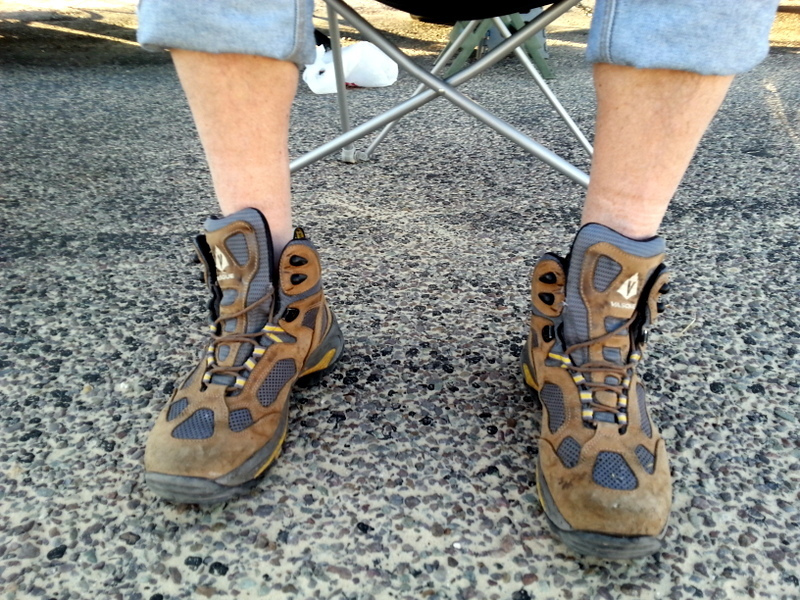 John’s sporting some kind of new sockless boots look. Not sure about this. 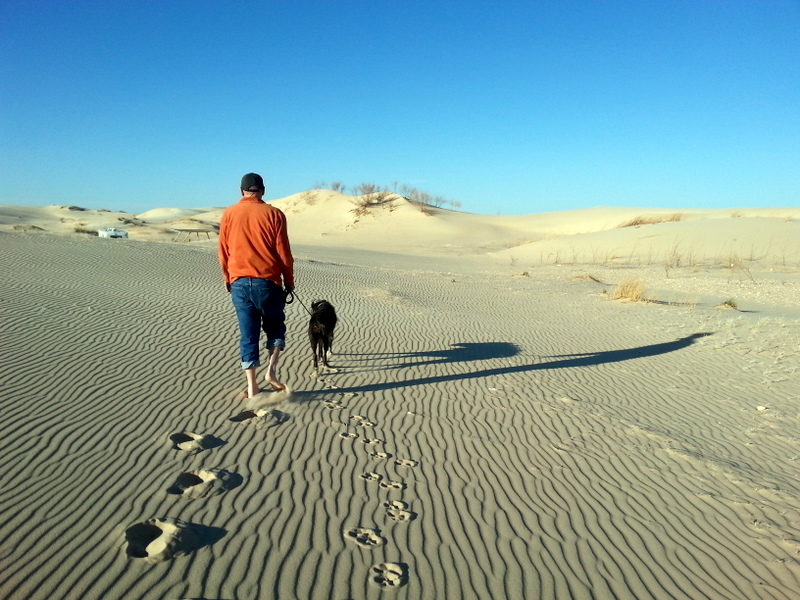 This entry was posted in dogs, great outdoors, retirement, RV life, simple camping, state parks, T@DA, Texas and tagged camping, retirement, road trip, RV life, simple camping, state parks, T@DA, Texas, the great outdoors by Judy Crankshaw. Bookmark the permalink. Your new header photo is PERFECT! It really captures the camping experience. 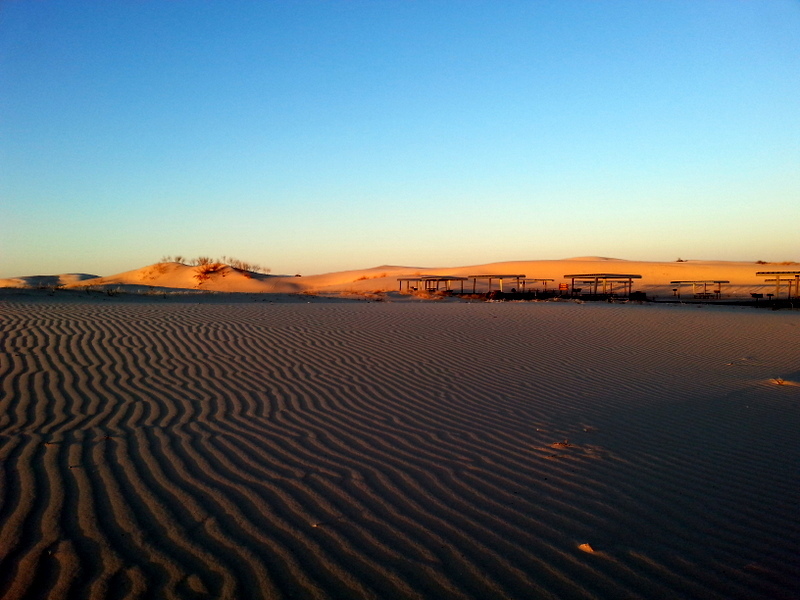 And the dunes photos are beautiful! Every woman should have a long-legged photo. Ego booster! Nice choice for the title photo…and who did you black and white sketch? Nine hours…guess when your in Texas and on a mission put the metal to the pedal! Are those the slip and slide boots…he may be on to something lol…. Sorry to take so long to reply…..this got kind of lost in some other email. I take photos with my Android smartphone. 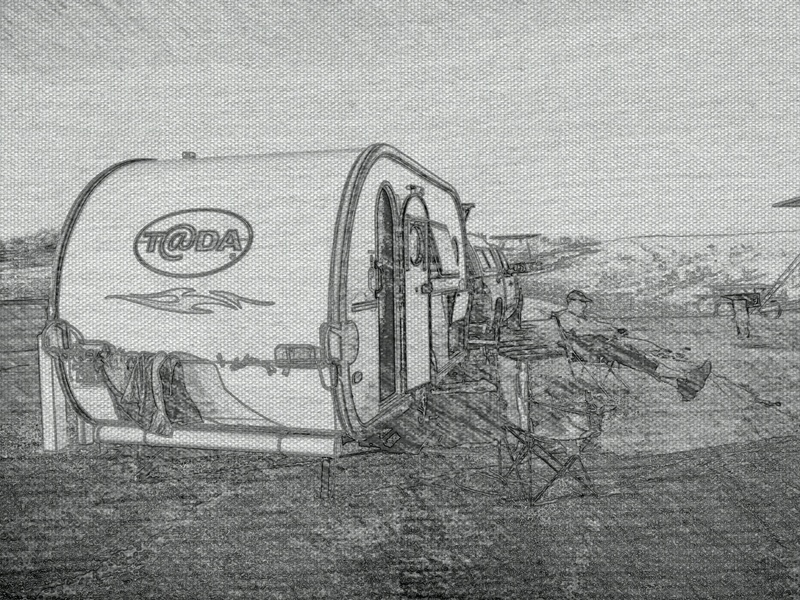 The “pencil sketch” was done with an app called Paper Artist. There are lots of fun photo treatments you can do with it. Free. I had a bunch of very cool photos that I had shot that day with different effects. Unfortunately, I forgot to save them. You have to save each one to your gallery (I think). Still exploring with it. Are you making fun of me?? How’s your one-legged turkey coming along? You may find us called in your driveway someday, we’ll see who’s laughing then! Are you warming up? I had the same impression of Texas the few times I was there for work, large and dirty. I’ll bet it was real pretty country before the European settlers trashed it. Not my favorite state, but we have really enjoyed their state parks. Wish every state had a bottle deposit like Michigan. That’s a fast start to the trash problem. But TX will be in our rearview mirror already this afternoon. Not sure where you are now, but Fredericksburg, Texas has an incredible museum of the Pacific campaign during WWII. Patty and I agree that, to do it justice, you could spend a week there. I did a SAG ride with the local bike club there. I found out the hard way that you don’t go over the cattle crossing grates at high speed…Two flats!!! Texas is a whole nuther country as they say. Lived there a couple times and that was plenty. Really cool photos, especially with the long shadows. Not sure which direction you are headed, but not far outside of Roswell, NM, there is Bottomless Lakes State Park this is an interesting place. Then you can head over to Carlsbad Caverns National Park if you’ve never been. Really cool place and be sure to get there before dusk so you can see the bats fly out of the caverns. 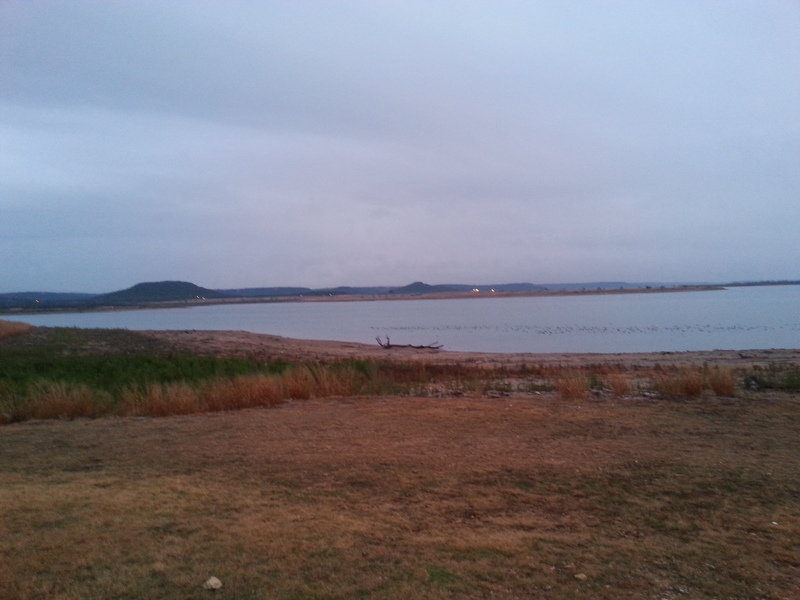 We are headed to Carlsbad, but camping at Brantley Lake SP. I looked on the Carlsbad website, and it looks like it might be the wrong time of year to see the bats. I would be creeper out by them, but would have to see them nevertheless.